The Pinewood Derby Race is now set! This fun event will be held at the St Thomas the Apostle Church located on Coulter St. in Amarillo on Feb 23. To register, complete the details on the attached Flyer and return to the Scout Service Center no later than February 21. 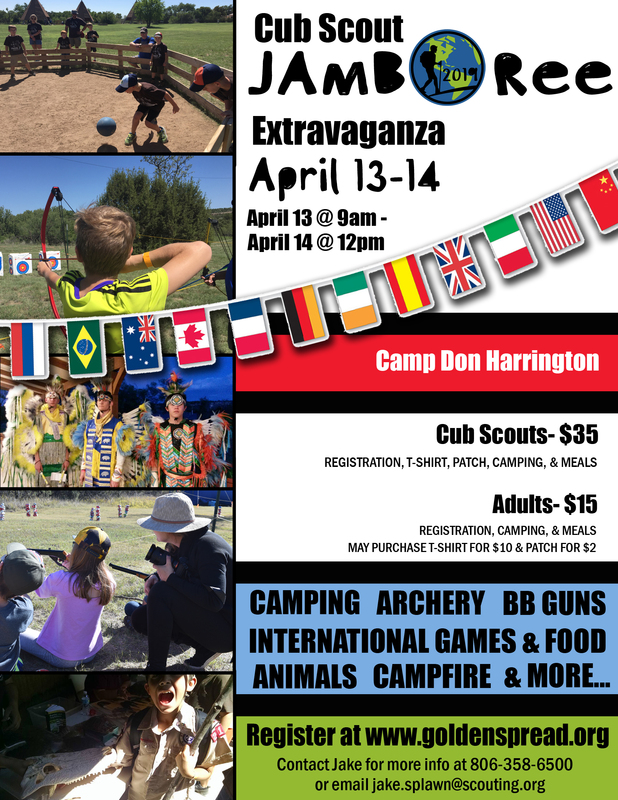 This exciting and fun filled event is for all Scouts BSA and will be held again at Camp Don Harrington. All Troops are welcome and highly encouraged to attend. Even if you are a “small” troop, your Scouts will have fun and learn at the same time. Due to anticipated poor weather conditions for Saturday, April 13, we are rescheduling this event to Saturday April 27. Please click on the link below for the new revised schedule of events and information…..
Join us for the 2019 Cub Scout Jamboree Extravaganza! To celebrate the Scouts BSA World Jamboree being held in West Virginia this summer, we decided to have our own Jamboree! Come enjoy international food and games at the first Cub Scout camp of the season! Please note that this is not a family camp, and only Cub Scouts and their guardians or Cub Scout leaders may attend. The family camp will be held in June this year! Group registration is STRONGLY ENCOURAGED for this event. Registering as a group helps keep your unit organized and drastically reduces wait time at check-in on the day of the event! A Group Registration Form is attached below for your convenience. Simply print the form, fill it out, and return it to your Den Leader or Cubmaster so that he or she may register everyone at once! Keep watch for the Leader’s Guide which will be released soon! This annual event is for the whole family- mom, dad, sister, brother, grandparents, etc! We’ve had over 200 Scouts and guests attend this experience each year so why don’t you join. 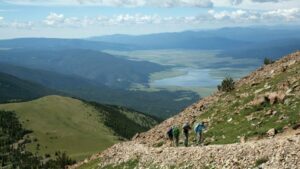 Philmont is breathtaking so you don’t want to miss out. Two person tents are provided along with Saturday Breakfast and Dinner (Lunch is on your own) and Sunday breakfast. Fun activities are available for you to participate or if you don’t want to do anything other than sit around or hike on your own, that’s ok with us! We will have a closing campfire program where everyone gets to participate and we have events on Sunday before your departure. This course is a prerequisite for BSA Lifeguard Training and for anyone planning to attend a Wilderness First Aid Training in this council or another council THIS YEAR! All registrants must be at least 15 years old! See the attached flyer for details and the registration link below! This course is a prerequisite for anyone planning to complete BSA Lifeguard Training or planning to attend a Wilderness First Aid course, either in this council or another council THIS YEAR. Registrants must be at least 15 years old! See the attached flyer for more information and the registration link below! Beaver Day’s at Camp MK Brown is an event where the OA helps get the camp ready for Summer Camping operations. Along with service, their is great fellowship and some fun activities. This course is for anyone who is currently a BSA Lifeguard and needs to re-certified, or anyone who wants to become a BSA Lifeguard. Please note that Basic First Aid/AED and Healthcare Provider CPR are prerequisites for this course. Both prerequisites will be offered at the Scout Service Center prior to May 18. If you do not have one or both of these prerequisites, you may register for them on our homepage! Attendees of Lifeguard Training must be at least 15 years old and the class is limited to the first 10 individuals to sign up, so act fast! See the attached flyer for more information regarding Lifeguard Training! Want to skip swim checks at MK Brown this summer? Required to have a completed swim check to attend a different summer camp? If you answered “yes”, this event is designed just for you! This is for individuals who are registered in Scouts BSA and Adult Leaders…. NO CUB SCOUTS! Cub Scouts will take their swim tests at camp! The third annual Scouts BSA and Adult Leader Swim Check Day is being hosted by the Golden Spread Council Aquatics Committee, completely free of charge! Keep in mind that this is the ONLY day that the council will offer this opportunity so sign up before the classes are full! Each hour-long time slot has a capacity of 30 swimmers! Below is the registration link and the information flyer! This advanced training is for all Scouts BSA and Venture Crew Members who meet the age and rank requirements (See Course Information for details). This training takes place at Camp MK Brown located near Wheeler, TX and is supervised by BSA registered Adults but instructed by experienced Scouts BSA who have attended the course in the past and have extensive training in this course. We are also looking for Staff Members. If interested, please see the application below. All participants must register and pay the deposit or full fee online (below) BUT MUST DOWNLOAD THE PARTICIPANT APPLICATION (below) AND COMPLETE THE FORM AND SUBMIT TO THE SCOUT SERVICE CENTER BY THE DEADLINE LISTED. This is our Family Camp for this year! Cub Scouts, Adults and Siblings are all welcome as this is a FAMILY CAMP! Registration is by family, not by Pack although each Pack will be put together for camping! The theme is Eagle Flight Crew! We will do Archery, Astronomy, Camping, Water Bottle Rockets, Helicopters and Planes, Airplane Design, Swimming, Weather, things that fly, and more! This will be packed camp!!!!! We are excited to offer Summer Camp to all our Scouts BSA members in 2019 at Camp MK Brown located near Wheeler, Texas. The 2019 Leader’s Guide is now available that tells you all about the camp, our programs, and dates and fees for the year. This is our first Weeklong Day Camp of the season! The theme is Beneath the Sea and will include a shirt, patch, program, lunch each day and a snack each day. Youth going into Kindergarten through 5th grade are invited to join in. Lions Scouts are not allowed to attend. Daily activities begin at 9am and end at 5pm. There will be an early dropoff and pickup opportunity. Early drop will begin at 8am and late pickup will end at 530pm each day. This exciting event, held every other year, is for any Adult, Scouts BSA, or Venture Crew member who wants to experience the excitement of both high adventure activities and other fun things planned, all around the Amarillo area! Camping at Camp Don Harrington, your days will have many different activities to participate in that you might not ever have a chance to do. In 2017, Powder Horn was very successful and we have built on those experience for the 2019 Course! Please take a look at the attached flyer to get some idea of what we will be doing and register ASAP. This is our second and final Weeklong Day Camp of the season! The theme is Beneath the Sea and will include a shirt, patch, program, lunch each day and a snack each day. Youth going into Kindergarten through 5th grade are invited to join in. Lions Scouts are not allowed to attend. Daily activities begin at 9am and end at 5pm. There will be an early dropoff and pickup opportunity. Early drop will begin at 8am and late pickup will end at 530pm each day. Wood Badge is an Adult Leadership Course designed to make you a better leader in Scouting, Business, and in your personal life. Taught by trained Scouters who have a passion for learning and to teaching others. The course is over two weekends in September at Camp Don Harrington and you are required to be in attendance the entire weekend staring Friday morning through Sunday evening. Put in for vacation now- you will be glad you did!!! You may register and put down your deposit or you may pay in full at the link below. There are only 48 slots available and they will fill quickly so don’t wait too long!!! As a reminder, you must be fully trained in your Scouting position as the course start date. Scoutmaster and Asst. Scoutmaster Training is available online at my.scouting.org. The Outdoor Training that is required will be scheduled at a later date. All Cub Scout Leader Position training;s are also available online at my.scouting.org. There is a Cub Scout Leader Adventure Academy scheduled at Camp Don on March 1-2 and is the only scheduled in-class training until November. Everyone must also have Hazardous Weather Training to be fully trained and is only available online at my.scouting.org. We do not anticipate offering an in-class Scoutmaster Position Specific Training, so online is your only available option.